Bad news for Skipper. One of my Motivationals. (It's also on Deviantart). HD Wallpaper and background images in the पेंग्विन्स ऑफ मॅडगास्कर club tagged: penguins of madagascar skipper kowalski rico penguin private. Kowalski: If you don't know, how could i? 0_o! Skipper: Is the baby healty? Is the heart working? Skipper: After the baby been born,we're all ganna make a DNA exam! I wanna know who's the father! Can you even know the gender? Kowalski: It's just 3 hours! Skipper: In how many hours will the egg came out? Kowalksi: 0_o...Huh...i honestly don't wanna know. Kowalski: NOOOO THATS DANGEROUS 4 UR BABY YOU SHOULDNT.....oh...0_o! ^Yeah!I like where your head is, soldier!!! XDXDXDXD!!! Random guy : MY CAR ! Kowalski: Is Skipper a dodo? I guess he is female after all. @skipper12a:LOL i know i am mad!!! XDXDXDXD!!! Skipper: Blowhole! Don't laugh at me! This is not funny! I had never thought ot this x'D What were you thinking King_Clemson, please??!! 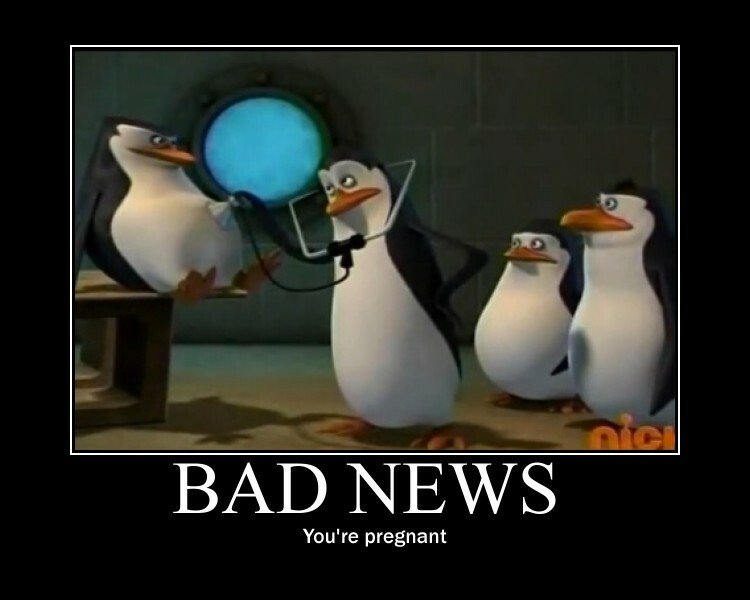 But it's true that in the photo it really looks like Skipper's pregnant. Who is the father? Hans? Blowhole? *Skipper slaps her* Uuuh, I don't know, Rico? Kowalski: Hum, is there anything you are not telling us Skipper? Don't kill me people, but when I wondered who the father could be, the first thing that came to my mind was Marlene. MARLENE. THE FATHER. O.O Clemson. You're OFFICIALLY evil now. Let's just take him to Maury.. I leave FanPop for ONE WEEK and THIS manages to happen??? Pregnant Skippers and other whatnots, like mustaches, a load of randomness about Doris and don't even GET ME STARTED on the comments! But every one of you guys is just epic, I was sad but I could only come on for a little while every night while I was doing homework to check my inbox (And chat with Penguins_Fan!). I hereby make an oath (I DON'T KNOW WHY AS A COMMENT ON A WEIRD IMAGE) To check FanPop PROPERLY at least once a day. oh my gosh, i love kowalski's face, he's like, "realy skipper?" and skipper is like "what? I just got carried away!"